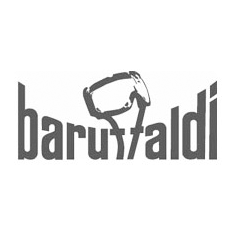 Baruffaldi originated in Milan in 1932 and is one of the world's most historic goggle manufacturers. They made goggles for legends such as Italian racing driver Alberto Ascari. The Vintaco goggle is a recent addition. The frame is a classic design widely available however the foam pad is covered with fine Italian leather in their factory. This sets the Vintaco apart from cheaper PVC backed goggles. Value and quality.